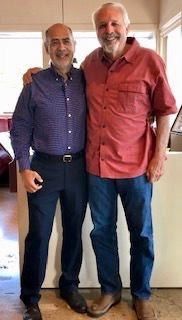 Last week during my visit to Santa Barbara I connected with one of my former athletes from the Santa Barbara High School cross country and track team: Raul Gil. I had not seen Raul for close to forty years. He graduated in 1977 and was captain of the 1977 track team and a team leader on the 1976 cross country team that finished seventh in CIF Southern Section (There was no state cross country meet then). Raul is a tremendous person and success story. He came to US from a small town in Mexico at age eleven not speaking a word of English, he was in ESL (English as a Second Language Class through his sophomore year in high school). Early on he maintained two paper routes, which he credits with teaching him business skills. In 1977 he was named paperboy of the year and won a trip to Europe. He graduated from Cal Poly San Luis Obispo with a degree in business and because of being paperboy of the year got a job with the local newspaper on the business side where he worked for over thirty years. Now he is a team leader for an international company. It was so good sharing stories and catching up. He told me that when I named him captain of the track team that it was the first time he had to get up and speak to a group in English. His children have graduated from college as well a majority of his extended family. Just sitting down with Raul reminded me that coaching is about people, yes, he was a fast runner, yes, we won championships, but most importantly Raul is a champion in life. He is someone to look up to and emulate. Raul thanks for making me a better coach and person, you are in inspiration to me.